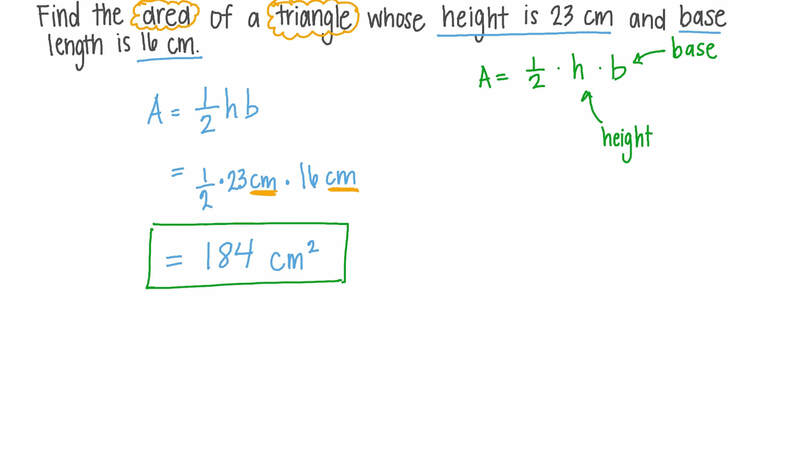 In this lesson, we will learn how to calculate the area of a triangle given its base length and height. 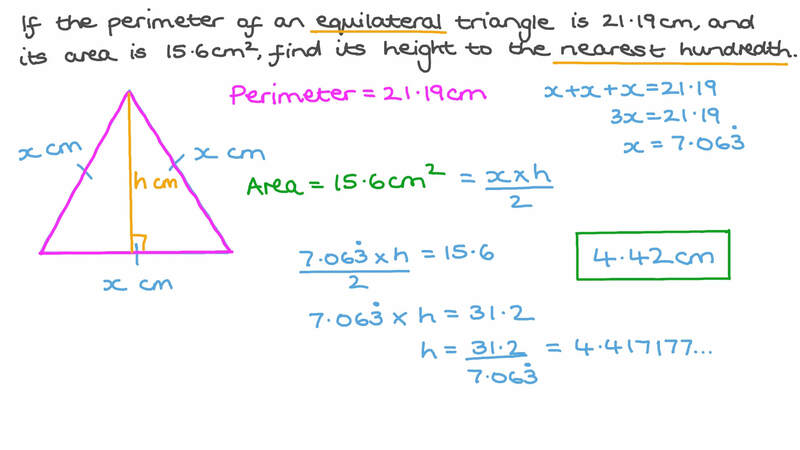 Find the area of a triangle whose height is 23 cm and base length is 16 cm. What is the area of the triangle on the front of Sherif’s maths folder? Find the difference between the area of a triangle whose base is 5.5 dm and height is 4 dm and the area of a rectangle whose dimensions are 21 cm and 16 cm in square centimetres. The height of a right-angled triangle is 47 cm. The base is 26 cm. What is its area? Find the height of a triangle whose base length is 13 cm and area is 299 cm2. If the area of the shaded part in the given figure is 675 cm2, find 𝑥 . If the perimeter of an equilateral triangle is 21.19 cm, and its area is 15.6 cm2, find its height to the nearest hundredth. 𝐴 𝐵 𝐶 𝐷 is a square. Find the area of △ 𝑋 𝐶 𝑌 . Find the area of △ 𝐴 𝐵 𝐶 . Round your answer to the nearest hundredth. Write an expression for the area in c m 2 , of a triangle of height 3 𝑥 3 cm and base 8 𝑥 𝑦 3 3 cm. The area of a triangle with base 𝑏 and height ℎ is 𝐴 = 1 2 𝑏 ℎ . Find the area of a triangle with a height of 16 and a base of 11. The base of a triangle is 14.45, and its corresponding height is 6 7 of that base. What is its area, to the nearest hundredth? The dimensions of a rectangular garden is 13 metres by 8 metres. Triangle 𝐴 𝐸 𝐶 represents the lawn where 𝐸 𝐶 = 6 m . Find the area of 𝐴 𝐸 𝐶 giving the answer to two decimal places. Find the area of △ 𝐴 𝐵 𝐶 . Find the difference in area between a parallelogram whose height is 9 cm and base length is 6 cm and a triangle whose height is 1 cm and base length is 3 cm. 𝐴 𝐵 𝐶 𝐷 is a parallelogram of area 560. Suppose that point 𝐸 is on 𝐴 𝐷 . What is the area of △ 𝐸 𝐵 𝐶 ? The area of △ 𝐴 𝐵 𝐶 is 12.35. Find 𝐶 𝐷 to the nearest hundredth. Determine the height, 𝑥 , of the figure, given that 𝐴 is the area of its coloured part. A triangle has area 8 1 2 and base 9. What is its height? A triangle has an area of 45 square feet and its base is twice its height. Find the length of its base and its height, give exact answers. All the triangles and squares in the quilt pattern shown are congruent. Find the area of one of the blue triangles and the area of all triangles. Given that 𝐷 𝐸 𝐹 𝑁 is a square of side length 100 cm, find the area of △ 𝑋 𝑌 𝐹 , and approximate the result to the nearest integer. Find the area of the △ 𝐴 𝐵 𝐶 and the length of 𝐵 𝐸 . 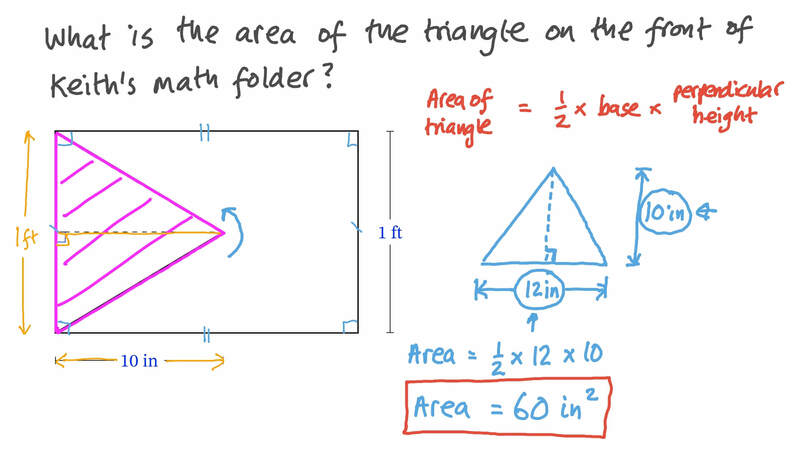 Work out the area of the triangle.